I am very happy to announce my next breedingplans for the summer. 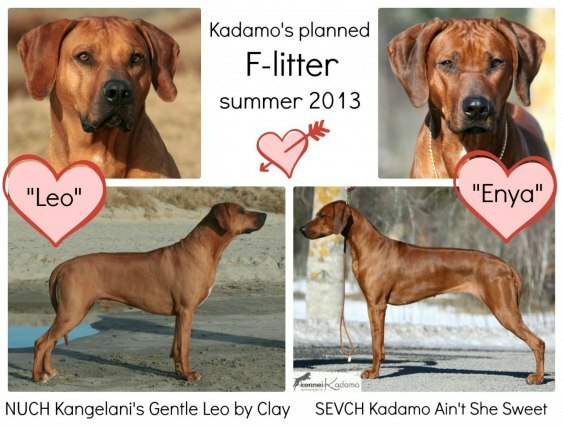 For the first time a dog bred by me will come back to the kennel to produce the next generation of little Kadamos! The dog that is making this happen is Moa's daughter Enya, SEVCH Kadamo Ain't She Sweet from my Beatles-litter. Read more about her on her own page, and read about the male I have chosen for her under Planned Litter 2013. I am very greatful to Marit at Kennel Kangelani for letting me use her very handsome male Leo, NUCH Kangelani's Gentle Leo by Clay. And also extremely greatful to Patricia Ljunggren who has taken wondeful photos of Leo for me last week! !